When a good friend of yours asks to meet up, it doesn’t matter (for me) where we end up. Jess suggested going to Panera Bread. I’ve never been to Panera Bread. And as you may know, I’m always up for trying new things (most of the time anyway). We met at the downtown location, near Dundas and Yonge. Jess wasn’t hungry. 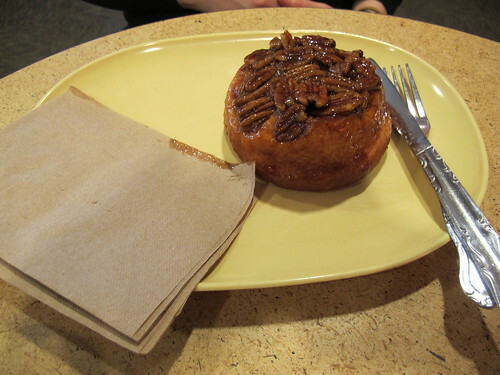 So she got this Pecan Roll from trading her points. I’m not sure how the points card works, but I think that if you get a certain amount of points you can trade your points for food. I was starving when I was waiting for her. She was late, and that made me more hungry than I already was. There is a variety of selection on their menu; salads, sandwiches, soups, bakery items, and pastas. I had trouble choosing as everything sounded delicious. I ended up choosing pick two. What is that? It might sound confusing, but basically you get to choose two different items on the menu (from different categories); soup and salad, soup and sandwich, soup and pasta, etc. There are many combinations that you can pick two from. And plus, it comes with a side; bread, water and something I can’t remember. I had the Chicken Tortellini Alfredo, Chicken Soup and bread. The bread was so good, maybe because it was crust-ful and warm in and out. I really liked the particular location that we went to.The lady that took my order was really nice and patient as I had a million questions to ask before I placed my order. Most restaurants are incorporating this into their system, but I was surprised that Panera Bread was also using restaurant pagers. We got a pager and then headed to our table. I guess it would make sense as when the food is ready, the staff know where and who ordered what. The restaurant had an upper floor, I guess it’s to suit the amount of customers they have in and out (it’s located at a busy intersection). It was quite upstairs and all the staff were friendly. 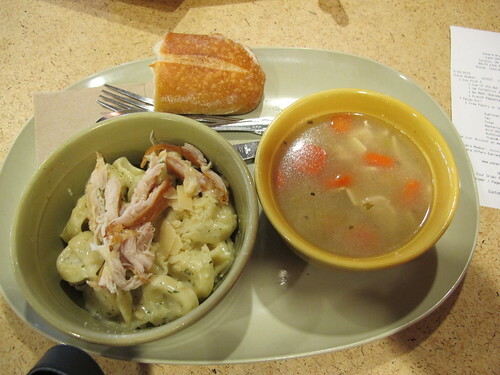 I definitely recommend going to Panera Bread and will eat there again. Click here to visit Panera Bread‘s website.